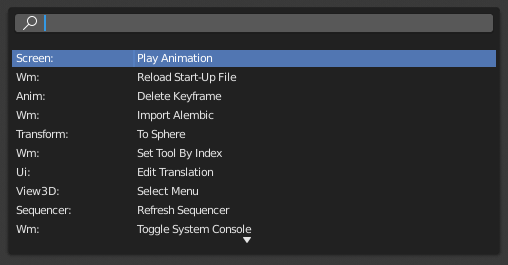 A pop-up menu with access to all Blender tools is available by pressing Spacebar. Simply start typing the name of the tool you want to refine the list. When the list is sufficiently narrowed, LMB on the desired tool or navigate with Down and Up, activate it by pressing Return.